Leo is a dramatic sign with some fundamental contrasts. Overall they are straightforward and highly predictable once understood. On the surface Leos are one of the most confident and aggressive signs. Fearless, charismatic and powerful. They’re some of the optimists and leaders of the Zodiac, always seeing the good over the bad, and often wanting to take charge and be noticed. They have a flair for the dramatic and often enjoy being the center of attention. Gaining the respect and admiration of others is what makes the Leo woman tick, and she has the perfect toolset to do it: Dramatic, warm hearted, outgoing, passionate and impulsive. Most feel the powerful presence of a Leo woman almost immediately. The Leo zodiac sign has quite the ego so focusing on her interests and goals is your best bet for getting a second date. But don’t worry about feeling left out of the relationship – she is extremely generous with her time and attention as well. Being queen of her castle, the Leo lady will make you feel like her king if you are able to keep pace with her active lifestyle.And she certainly doesn’t stand still for very long for she is busy and ambitious. She thrives on power and is always looking for the next fantastic opportunity. Make sure you understand her need for freedom and give her plenty of space, or else she will kick you to the curb and not think twice about breaking up. And be sure to keep things interesting for she grows bored easily. Dates that involve competitive sports, outdoor activities, or spontaneous trips will keep her on her toes and by your side. And let her choose date ideas too, for she’s a natural born leader. She can take over your entire relationship without you even realizing it, but be sure to stand up to her once in a while. The Leo woman needs a strong, confident partner to join in ruling her world, one who can manage his own affairs and help with hers if needed. The first step is to give her praise and adoration. The relationship will never work if she does not receive this from you. Do not look at other women when you are with her, she has to be the only one in your eyes. The thought of competition with other women completely turns her off, for she is marvelous and grand and better then any other woman (in her eyes)! Be prepared however to compete with other men. She attracts men, deliberately or not, because of her dazzling personality. She makes a good partner because she gives undying affection and love and makes you feel really mood about yourself. She is kind and supportive with an adventurous streak, she is always fun to be with. Leo woman will dominate, But not completely for she still needs the man to lead the way and give her the desired sense of approval, she looks up to her man. 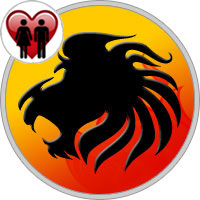 Leo woman is perfect for the man who is affectionate and has a strong character but not too controlling. She needs someone who is passionate about everything in their life and who strives for the best in everything, because so does she. Like all other members of this Zodiac, a Leo woman too loves to have a large family about her. Think of the lion in the jungle surrounded by his pride and lording over them. However like the lion too, she is unlikely to be interested in the actual running of a house or the bringing up of children. Family for her means all the more people to enjoy with and look up to her. The daily routine of a domestic life is likely to bore her since she is happiest playing the queen of the house. Interestingly, a Leo can be quite sentimental about his or her family, so expect your Leo girlfriend to cry buckets on family weddings and reunions but then happily place herself at the center of the crowd for the family shoot. A Leo’s tendency to seek the limelight can at times lead to vanity and an obsession with the self. She may be slow to understand someone else’s feelings and slower to respond to them. The emotional connection that is so necessary in a relationship may be lacking since a Leo woman is primarily concerned with her own needs and desires. Partners can feel pushed to the sidelines if a Leo insists on taking the center stage all the time. A successful relationship requires both partners to be receptive of each other’s needs and emotions. Having said that, loyalty and honor score highly with Leo lovers. She may be happiest with admiring friends and family around her, but once she gives her heart to you, she is unlikely to cheat on you. At the same time, what she wants is respect and fidelity from her partner in the long run, much more than attention and expensive baubles.